Sailing on this fast 57' catamaran is an experience to remember. 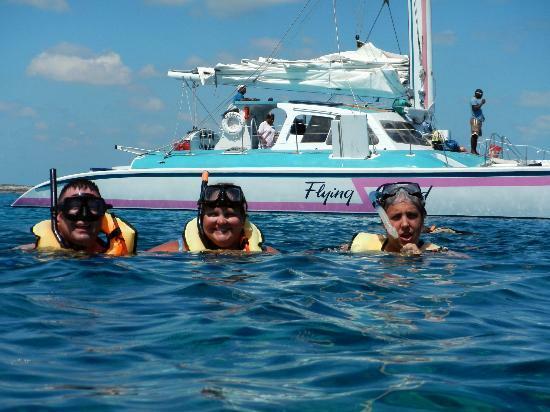 Flying Cloud and her crew want you to enjoy a day of sailing and snorkeling, or a romantic sunset at sea. Captain Craig and his crew are waiting to give you the experience of a lifetime! 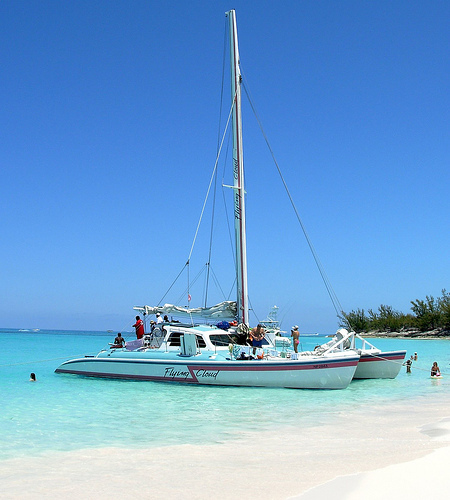 Experience sailing on a 57ft catamaran and enjoy the tranquility and luxury of sailing to a nearby island paradise. Similar to the half day sailing and snorkeling cruise, but includes a visit to world-famous Rose Island beach and its gorgeous coral reefs. Choose your favorite activity: snorkeling, exploring the island, tanning on the beach, or playing volleyball and other beach games. Also includes a delicious BBQ rib and chicken buffet with salads, Bahamian peas 'n rice, and fruits, all served on-board in comfort and shade. Come enjoy a wonderfully fun experience for families and couples alike! Cruise times subject to change according to season. Private charters are available for business groups, parties, weddings etc. The trip departs at the captain's sole discretion. No refunds for bad weather will be issued unless Flying Cloud cancels the excursion. Flying Cloud reserves the right, under certain weather conditions, to omit specific portions of the program or to choose an alternate location depending on the condition of the ocean.